If you have the time and just a few computer skills you can easily make you own funeral slideshow for free. While there is an endless array of "slideshow makers" out there, many not-free, chances are you already have on your computer (Apple or PC) everything that you will need. And if you can't find the editing program that came with your computer then there are more than a few reputable photo sharing web sites that will let you upload, arrange then convert to a slideshow for free. A funeral slideshow or video memorial typically consists of 40 to 80 photographs. If each image shows for around 6 or 7 seconds then the show will last from 5 to 10 minutes. Aim to gather photos from across the person's life. Often-times this involves getting in touch with friends or other members of the family to ask what they have. Resist the temptation to pack in hundreds of photos at rapid speed (like the end-of-year high school sports slideshows). Less is usually more so choose the best. Try to allow enough time for each image to be comprehended and thought about. You will probably need to digitize some images - that means you need to get them into your computer using a flatbed scanner (or by carefully taking digital photographs of them.) You should, if possible, clean the images up with a simple (free) photo editing program like Microsoft Photo Editor (older PCs), Microsoft Photo Gallery (newer PCs), or Apple iPhoto. On occasions, the funeral slideshow will feature video taken of the deceased, and in rare, lucky instances there may be old film footage of the person taken in their youth. Sometimes, other items like hand-drawn cards from the grandchildren are included, or letters written by the person sometimes showing their usually graceful handwriting - or maps or postcards showing the geography of the life - even favorite poems or sayings can be incorporated in the memorial video. As the old song has it: "Don't it always seem to go that you don't know what you've got till it's gone?" So it often seems to be with the lives of our loved ones. We just kind of act like they are going to live forever. And they do. Until they don't. It's a sad time, sometimes a tragic time; and just the time when we are feeling most distressed, it often falls to us to get busy and make preparations for the funeral. So we try to push away the grief and get on with the necessary arrangements. On the passing of a loved one, thoughts turn to remembering and honoring the life with a funeral slideshow or memorial video. 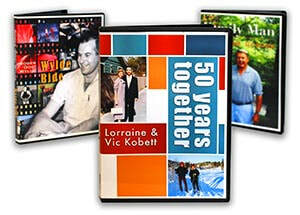 While there are professionals like us ready to help, you can easily create your own video memorial or funeral slideshow DVD with any one of these 5 programs available free from large, reputable software providers. All the photo slideshow programs below are provided by major and reputable software companies. Most will give you the ability to set the time you want each image to appear, select transitions between the photographs, add music, and add wording. One or two will allow you to add narration. Give yourself plenty of time though. While the programs are easy to learn, getting the memorial video slideshow just right requires some fiddling and finessing - it's the old 80:20 rule. You may spend 20% of your time getting the pictures into position; you may spend another 80% of your time fine tuning! Bundled with most PCs running Windows 10, this excellent program allows you to create basic slide shows with video and photos, music, titles and transitions and some special effects. You can also use Movie Maker to upload video from a video camera or to record video from your webcam. and opened it up, just drag and drop photos and video from any folder. You can trim video (just play and hit "i" to make that point the start or hit "o" to make that the end point. You can also add music (home > add > add music), adjust its volume and fade it in and out. And there are tools for text captions and titles. For those who use Apple Mac computers, you will have iPhoto installed with the computer. 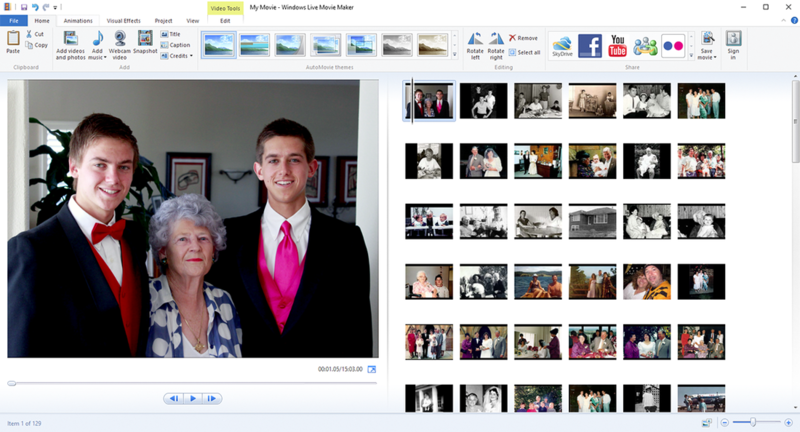 Creating a slideshow is as simple as choosing an album then clicking the slideshow button. A panel opens with your slideshow and a range of controls at the bottom. You can add correct contrast and color settings, add picture effects and transitions as well as select music to accompany the tribute slideshow. Once you have music selected, you can choose to fit the pictures to the music, or fit the music to the pictures - a handy feature not offered by all the other programs. You can also apply a Ken Burns effect (called the "Ken Burns effect") although it is not as controllable as the pan controls in Microsoft Photo Story. Having created your memorial slideshow, you go to file in the top menu, then file>export and select your movie size and where you want it. If you want to burn the movie to a DVD, then with your Mac you should have iDVD and you can set the funeral slideshow to be written to a DVD that can be played on any DVD player. Microsoft Photo Story is a photo editing and photo slideshow program distributed free by Microsoft and which functions with Windows 7 and earlier. (A word of warning here: if you need to download it make sure that the site you visit for your download of Photo Story 3 is "microsoft.com". Other, non-Microsoft, websites may try to lure you in with offers to download Photo Story only to entice you to click on buttons that take you to places you may not want to go). Photo Story 3 - the last version - is quick to download and easy to use for a funeral slideshow. You simply import your images; crop and correct contrast and color levels (if you wish); change an image to B&W, sepia or add another effect like "soft glow"; add text; add narration or voice over; decide how long you want each image to stay on for; select a transition (you have about 60 to choose from); add music and you are all done! Moving around a photo or going from wide to close (or vice versa) is a popular effect (sometimes called the "Ken Burns effect") and you can easily achieve that with Photo Story 3. 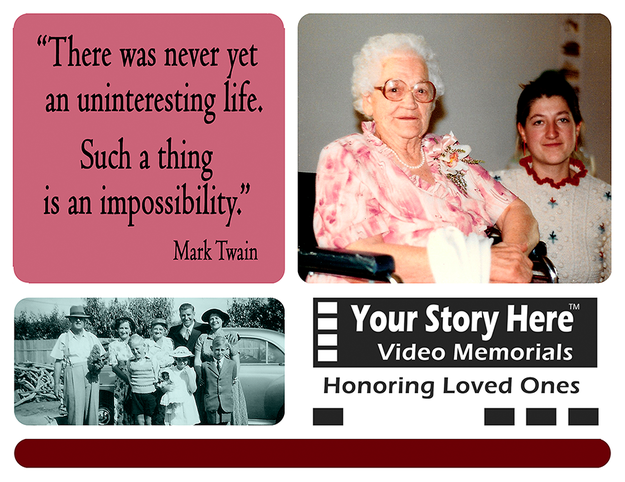 A video memorial prepared with Photo Story can be emailed, saved for later play on your computer, or saved to be played on another computer with Windows media player. You may not have heard of "OpenOffice Presentation". It is like Microsoft PowerPoint except it is free. It can be downloaded from the OpenOffice website. OpenOffice Presentation is promoted and supported by tech behemoth Sun Microsystems and the program can also open PowerPoint and output to PowerPoint. Not often thought of for funeral slideshows, both OpenOffice Presentation and Microsoft PowerPoint are powerful and flexible business programs that allows you to display images, create text, and embed audio and video. Both programs comes with endless templates which you can use as a background - or you can choose to have the images fill the screen. The beauty of OpenOffice Presentation and PowerPoint is that there is always someone in the family (if not you) who knows how to use the program - because they have used them at work. You can save them time by digitizing the images and determining how long you want the photos to show - then see what they come up with. Once you have created the funeral tribute to your satisfaction, you can save the presentation on a disk to be played later at the memorial service. And as with any audio visual presentation, always test the slideshow on the computer you intend to use - and at the very venue you are using - before the big day. Gremlins have a way of creeping into the best laid funeral slideshow plans and even experts come up against issues that need solving. Google Photos replaces "Picasa" and both are photo storage and photo editing applications. In Google Photo, your photos remain private but you do have to be OK with them being stored "in the cloud". Using the + Story icon you can add photos and video - but the slideshow functionality is at time of writing very limited. You can no longer download Picasa from Google, you will have to choose another provider (but take care in doing so). Then simply open it, select your pictures and using the "add to" button place them in an album. Then select the album and simply click on the "slideshow" button at the top. To add music and to choose a loop option, go to the menu bar and select tools >options>slideshow and check the boxes. By clicking back on "slideshow" you can adjust display times and add captions. Once you have your funeral tribute slideshow set up, simply select the folder or album from the right hand panel, go to "create" from the top menu and choose movie. Decide the size and the compression (small, large, widescreen) and you're off to the races! Also serving Los Angeles County; Long Beach; California; the USA - and the virtual world.